proteins by affinity purification and LC-MS/MS. Thenetworks of VRK1 and VRK3 interactomes were found to be associated with important biological processes such as the cell cycle, DNA repair, chromatin assembly, and RNA processing. 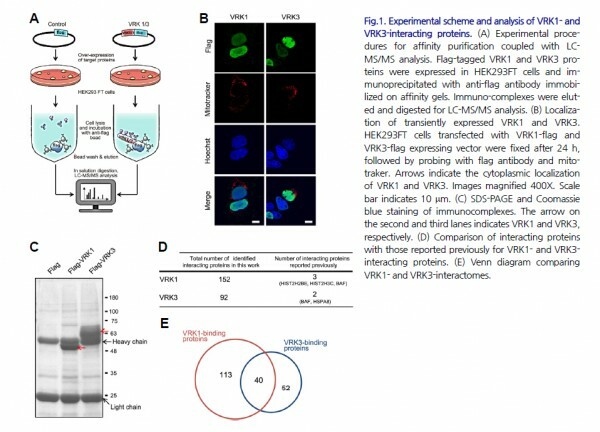 cells and tissues, VRK1/VRK3 were highly upregulated and its depletion affected cell cycle progression in the different phases. resource for investigating the unidentified functions of VRK1/VRK3, but also an insight into the regulatory roles of VRK1/VRK3 in biological processes. 다음글Autism-like behavior caused by deletion of vaccinia-related kinase 3 is improved by TrkB stimulation.